The QuickAreas application automatically retrieves the area extension of one or more polylines and inserts a text at the centroid of each polyline with the corresponding area value. The user has the option to select the units for the areas in the inserted texts, including square meters, square millimeters, square inches, square feet, acres and hectares. This app also let the user to automatically enumerate the polylines and export their respective area values to an Excel file. 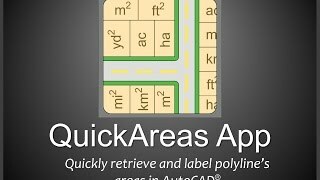 QuickAreas can be used in all Autodesk® AutoCAD® vertical products, including Autodesk® Civil 3D®, Autodesk® AutoCAD® MEP and Autodesk® AutoCAD® Architecture.